Tacoma Mayor Marilyn Strickland has graciously agreed to serve as host for this community fundraiser to benefit the Maxine Mimms Academy's new community food growing project, Garden of Eden of Tacoma. The Maxine Mimms Academies' local community food growing project is called the Garden of Eden. 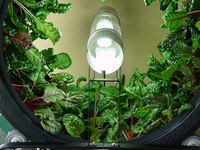 An indoor farming demonstration pilot program designed to grow affordable, organic herbs, fruits and vegetables all year round. This fundraiser is the first in a series of events that will highlight the importance of our communities access to fresh affordable organic fruits and vegetables. The Garden of Eden is an innovative new approach to urban farming, and offers a holistic approach to food access and community nutrition policy; to better community health, ecological integrity, food education, skills training, local job creation and the development of complete communities. A short presentation will discuss the advantages of year-round growing cycles as a sustainable business model, new technologies for growing organic foods at much lower cost, new work opportunities for local residents and the impact on our communities needed economic revitalization. A fabulous silent auction will also be held, so come prepared and enjoy the company - all are welcome. Refreshments - Entertainment - Silent Auction and more !